Ben & Jerry’s Free Cone Day 2015 is here! 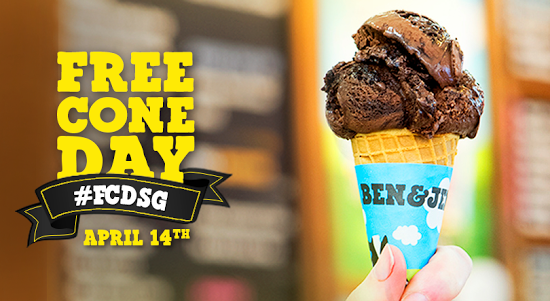 Ben & Jerry’s Free Cone Day moo-ment is back on 14th April 2015, you can get to taste the 18 euphoric flavours across all scoops shops in Singapore! To thanks Singapore loyal moo-niacs for their support, Ben & Jerry’s will be turning their notes of thanks into music for everyone’s ears on Free Cone Day FM (FCD FM) – Can you believe Ben & Jerry’s actually is creating a music station especially for their fans?! This dedicated channel will broadcast Ben & Jerry’s fans’ song dedications on Free Cone Day, to accompany them as they wait in line for their free cones of ice cream. The moo-tastic DJs will turn fans’ messages into songs, and selected dedications aired will be featured across all scoop shops real-time as an extra special thank you! Fans can simply Instagram / Tweet (@benandjerrysg) their messages and song requests, or comment on selected posts on Ben & Jerry’s Facebook with the hashtag #FCDSG in their dedications to participate in this moo-tastic move. In conjunction with the trails this Free Cone Day, Ben & Jerry’s will be supporting South Central Community Family Service Centre (FSC), all donations made to South Central Community FSC on Free Cone Day will be used to set up a community emergency fund to match community efforts to help their neighbours out of financial crises. You will be able to learn more about this initiative from the South Central Community FSC volunteers who will be at the scoop shops to share!